Norwegian trio Einherjer aren't generally spoken of as being among the elite of Viking metal, despite having been active since 1993 and pretty consistently solid, if unexciting, over their six-album career. Av Oss, For Oss ('by us, for us') the band's sixth full-length, continues this run of quiet success, leaning heavily towards heavy metal in sound but with croaky blackened vocals and an approach to songwriting that is just about varied and interesting enough. After suitably epic opener Fremad sets the pace with some epic instrumentation, Hammer I Kors is melodic and pounding, throwing some subtly experimental percussion in but sticking to a traditional Viking metal sound with atmospheric guitarwork from Frode Glesnes (the best thing about this band by a mile) making a good effort to raise the hairs on your neck. The album doesn't really get exciting until Nidstong, however, which is more energetic and grooving, staying atmospheric with wordless backing vocals and straying into black metal territory in the verses, enjoyably rhythmic and thrilling use of guitar solos. Nord og Ner may start simply, with a slowed-down rock n'roll riff, but breaks in the middle for a rather beautiful atmospheric section, and by the time it ends is a grooving anthem. From then, Nornene ups the Viking measure slightly with some yelled vocals and a more complex sound, and Trelldom starts quietly but rouses effectively. The title track, in its place as the ten-minute finale, is close to a standout, hitting all the right Viking metal touchstones (backing vocals, epic Bathory-esque riffs, etc) but again, aside from some great soloing is unmemorable and nothing that Viking metal fans won't have heard before. Only being a trio sometimes makes Einherjer feel like they are underpowered – a bit more oomph with some of these songs would make them far better. Songs touch on hooks but for the most part are content to ignore them, battling along quietly, never really making you feel like the band are at full power. 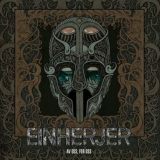 Einherjer are clearly content with their place in the metal pantheon, and this is accordingly a suitably unchallenging album.